Jean Baptiste Huet was a versatile French artist of the second half of the 18th century. He was a painter, an engraver and a designer. 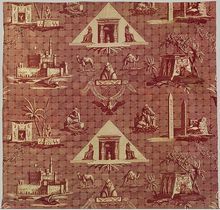 He had a close collaboration with the textile manufacturer J-C Oberkampf from 1783 to 1811. 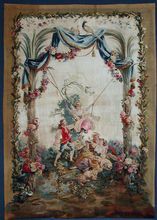 His style, influenced by Francois Boucher , was typical of the 'return to nature' fashion of the second half of the 18th century. 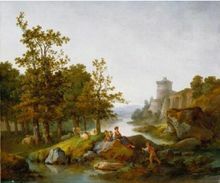 Jean Baptiste Huet was born in 1745 to a family of artists. His grandfather, Christophe, and his own father, Nicholas, were both painters. He was an apprentice at the workshop of Charles Dagomer, an animal painter (see below) and later with Jean Baptiste Leprince, a leading student of the great painter Francois Boucher (1703-1770). 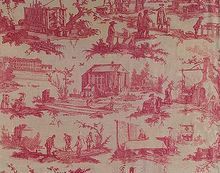 Around 1764 Huet entered the studio of Jean-Baptiste Le Prince, where he further developed his skill as an engraver; most of his engravings and etchings were reproductions of his own work. 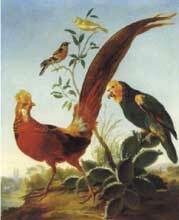 In 1769 Huet was accepted at the Royal Academy as an animal painter. During the last thirty years of his life Huet focused on the decorative arts, designing for Oberkampf and publishing prints after his own designs. Christophe Huet I (born 1633): Jean Baptiste Huet grandfather . He was a painter. Christophe Huet II (1700-1759):Jean Baptiste Huet unce.Well known for his paintings of animals ( Chateau de Chantilly, Hotel de Rohan, Paris). Nicolas Huet: Jean Baptiste Huet father. He was a painter at the King "garde meuble". Charles Dagomer: he was a step-uncle of J B Huet and he gave him his first painting lessons. Gilles Demarteau: he was an engraver who worked for Boucher and J.B Huet. Bernard de Montfaucon (1655-1741): published "L'antiquite expliquee et representee en figures" in 1719, a book that influenced Huet style.